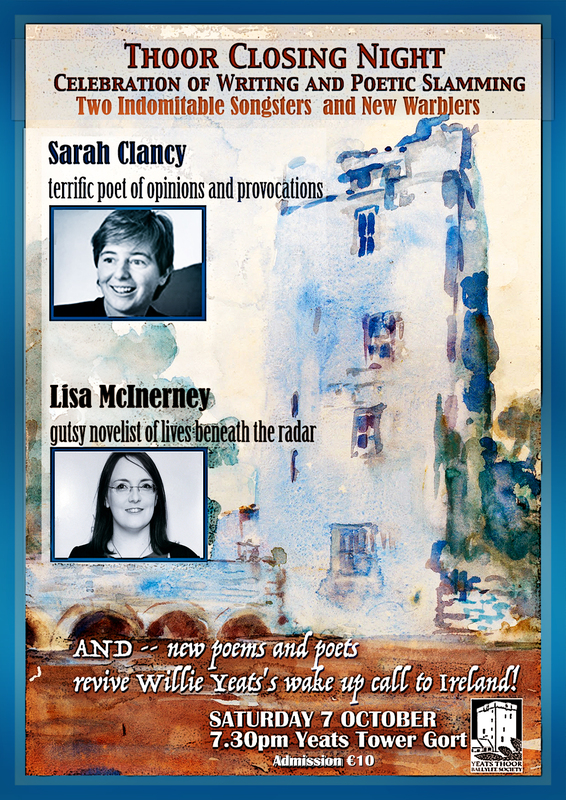 Come and join the excitement as Sarah Clancy, Lisa McInerny, and our Thoor ‘write back to Yeats’ competition winners perform. Mingle with our indomitable songsters and new warblers. This is Thoor Ballylee’s season closing event of 2017. Don’t miss out! There will be a modest award for the poem which, in the opinion of the audience, best responds to Yeats’s poem. Sarah Clancy, author of The Truth and Other Stories. This is Sarah’s third collection of poetry. In it she excavates the personal and psychological wreckage caused by an unrelenting recession in her native Ireland and further afield – with sacrificing the warmth, wit, or linguistic extremity for which she is known. Lisa McInerney’s first novel The Glorious Heresies won the 2016 Baileys Women’s Prize for Fiction and the 2016 Desmond Elliott Prize. Her second novel, The Blood Miracles, was published in April 2017 and she is just finishing her third. She lives in Gort.